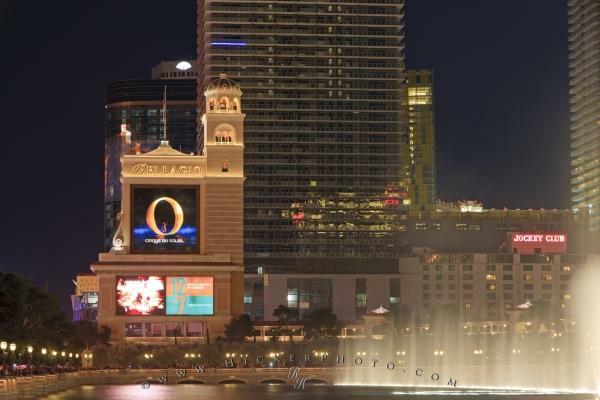 The distinctive Bellagio sign is lit up at night and features it's main attraction, Cirque du Soleil's O and cannot be mistaken as one drives or wanders along the famous Las Vegas Strip, beside the water show of the hotel and casino. Surrounded by high rise apartment buildings, the Bellagio Hotel and Casino sign stands out at night as it attempts to lure visitors to it's main attractions. The sign of course competes with so many other billboards vying for the attention of passers-by - night and day along the Las Vegas Strip. Bellagio Hotel and Casino, Las Vegas, Nevada, USA. Photo of the Bellagio Hotel and Casino sign at night along the Las Vegas Strip, Nevada, USA.